In the cycle of the traditional church year, the time between Pentecost and Advent is considered “ordinary time.” But these are not ordinary times, either in the church or in terms of global ecological disruption. To be faithful and relevant in such times, it is essential that churches be intentional about addressing the new and challenging questions of faith and ethics that are raised by our unique situation. Through a structured progression of worship themes in the summer and fall (in the Northern hemisphere), our congregation, along with many other Christian congregations will develop theological perspectives that are Earth-honoring, explore a prophetic approach that includes both challenge and hope, deal with pastoral issues of grief and fear, and entice our community and others toward new visions of a just and sustainable global society. We look forward to these not so ordinary but exciting times! This initiative began in 2015. Guilford was involved in 2017. 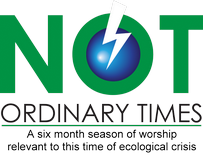 Read more at the Not Ordinary Times website.